In the previous part of this series looking at changes in the way I have consumed music during my lifetime, I was talking about the introduction of the Compact Disc into my listening habits. For a couple of years, I was very picky about when I would spend £11.99 on a compact disc album and when I would prefer to spend £6.99 on a vinyl copy instead. Not least of my concerns was that I had a record player in my teenage bedroom, but the Compact Disc player in the house was downstairs in the sitting room. That all changed when I got my first CD player. By the time I purchased a Compact Disc player for myself, the technology had miniaturised somewhat, and the multi-disc player was the new must-have music gadget. There were two main types of auto-changers for CDs. One variation on the format was to have the discs arrayed in a platter, which revolved into the play position where the laser could read the disc. I opted for the alternative system - a cartridge held six discs, and they were selected in turn to be moved into the playing position. If the single disc CD player had bought greater flexibility into the way that albums could be listened to by allowing for random play or the re-programing of the track order, then the auto-changing CD player brought a whole new dimension of playlist making. My 6CD auto-changer allowed me to program up to 32 tracks in order from any of the discs, or to put the system on random play where it would play each track from each disc in a random order. I take it for granted now that on my 80Gb iPod I can instantly play any one of 10,000 or so tracks, however the programmable multi-disc player was a step-change in making what we would now call 'playlists'. The music system I had was a Panasonic, and it wasn't without its flaws. The CD changing cartridge mechanism was a little frail and could sometime get stuck. The default cartridge wasn't able to cope with the 3" CD single format that the music industry tried to push in the early 90s. That meant that in order to play the early Depeche Mode CD singles from the 'Violator' album I needed to purchase a different cartridge specifically designed to accommodate the smaller format. By 1990, CDs had practically completely replaced vinyl for me for purchasing albums, unless the vinyl was a specialist release. My previous misgivings about paying extra for CD releases of lo-fi recordings had subsided. A lot of this was to do with the fact that the price of vinyl seemed to increase in a directly inverse proportion to the quality of the vinyl pressing. It was a widely held conspiracy theory that record companies were deliberately cutting corners in the quality of their vinyl pressings, in order to convince people like me to move to the new format. The CD auto-changer also made a difference to the way I assembled playlists for my journeys to and from school, work and then the university campus. When I had first started taping records in the early eighties, you could never accurately predict how long a vinyl record would last just by looking at it. And, if you wanted the tracks recorded onto cassette in a different order to the way they appeared on vinyl, or to miss one out, you had to physically attend to the recording, hitting pause in the right places and moving the tone-arm around the album. With the multi-change CD however, you could program exactly 45 minutes worth of music to record. By flicking through your selection in advance you could get the track times from the digital display, add them up, and ensure that your new tape compilation wasn't going to exceed the amount of time you could get on one side of a tape. Once you'd done a bit of homework, you could simply press record on the cassette deck, press play on the compact disc player, and then leave the machine to do the rest. 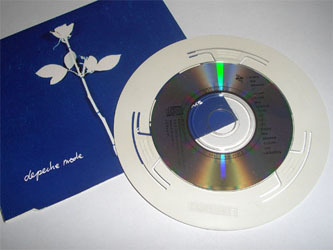 CD booklet and printed details on disc. Multi-disc player assigned 'disc number' to album depending on the slot it occupied within the machine. Programming a selection of tracks from up to six compact discs. Using the digital display to make compilations that fitted neatly onto blank cassettes, for subsequent use in a portable cassette Walkman. Radiohead, R.E.M., U2, Depeche Mode, Nitzer Ebb, Jesus Jones, Fields Of The Nephilim, Manic Street Preachers, Mansun, Blur, Kraftwerk, Pet Shop Boys, Pulp. After the Compact Disc, I next used the MiniDisc as my primary means of consuming and making 'playlists'. However, that doesn't mean I adopted every new format that the music industry tried to foist on consumers. In the next part of this series I'll be looking at the doomed attempt to turn the cassette format from an analogue one to a digital one with DAT and DCC. By Martin Belam on 22 July 2008.